When we originally had planned on visiting a wine store in Lisbon, it was our intention to go to Garreifara Nacional, a suggestion offered on Roy Hersch’s Forum, For the Love of Port, but events didn’t turn out as we had planned. With our trip completely booked with tastings, tours and dinners, we were stretched thin as it was, and finding both the time and the wherewithal to purchase wine before we left was a mystery we had yet to solve. Fortunately, a friend of ours came to our rescue with a plan. On the Monday, we had scheduled a rooftop tasting looking over the Ebro River but with an hour to spare beforehand, we made a quick jaunt to Garrafeira Campo de Ourique, a small boutique Portuguese wine shop located just east of the Parque Florestal de Monsanto and west of Avenida Infante Santo in Lisbon. Although not dead center in the tourism Mecca near the port, it is easily accessible by a cheap taxi ride. Opened in 1988 by Arlindo Santos, Garrafeira Campo de Ourique is small, quaint, and defines the word, cozy. Hundreds of bottles line the wooden shelves from floor to ceiling with only a moving ladder to aid in your heroic feat of taking a bottle from the top shelf, it makes you feel as if you’re in an old English apothecary than a Portuguese cellar. 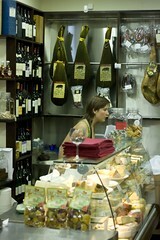 Categorized by region and then by style, it’s a wonderful shop with fantastic service. And although they could never compare with Garrafeira Nacional’s vast selection – we’re talking David and Goliath here – they can absolutely compete in price. We’re not alone in recognizing their value either. Currently, Garrafeira Campo de Ourique is designing wine menus and supplying wines for some of the most popular restaurants and hotels in Lisbon, including the Four Seasons Hotels. In conjunction with their Port and Madeira tastings, we feel this shop is absolutely worth your time to check out if and when you pass through Lisbon. 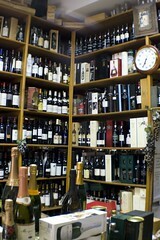 In 2006, Arlindo transformed his small grocry store into a boutique delicatessen and wine bar located just across the street from Garrafeira Campo de Ourique. Gaining success from both stores, Arlindo chose to fulfill a lifelong dream and revamped the delicatessen into more of a gourmet shop and wine bar called, Aromas & Sabores. Offering artesanal Portuguese products such as varies compotes, regional breads, traditional egg based pastries, unique olive oils made from native varietals, a wide selection of cheeses, cured hams, and of course, wine, it’s the type of store you get lost in for hours debating which product you want to carry back in your suitcase. Upon walking through the front door, if you turn left and pass both a delicatessen on one side and a coffee bar on the other, you take a quick right up a small set of stairs to a back room with 6 wooden tables adorned with wine glasses, regional olive oil and basalmic vinegar. Watercolour wine paintings in beautiful pastel colours adorn the walls making the room feel more like someone’s living room than a hip, trendy wine scene. Continue past the tables and you’ll walk into an 8 by 10 tasting room with a large oval table and plenty of chairs for a wine and food tasting. This room was designed specifically with private tastings in mind; however, Aromas & Sabores is still working the details with wine producers and liqueur companies, and therefore, won’t be booking the room for a few months yet. Although if you see the owner sitting in the backroom with a producer with plenty of half full bottles of wine, anyone who has the great fortune of being in the wine bar at that moment will have the opportunity to try and comment on the wine. Not a bad deal if you ask me, especially if the wine hasn’t even hit the market as of yet! So what makes this place so unique, so different, and so worthy of a visit? Simply put, great food and even better wine. Having an hour to spare, we allowed our gracious host and part owner, Mafalda Santos, to put together a small wine and food tasting for us so as to get a general sense of the bar. Much to our delight, we had a fantastic tasting, complete with five different regional cheeses, a series of cured hams, regional olives, artesanal bread and fantastic olive oil. I pointed out my complete and utter addiction to the Serra de Estrela goat cheese that has a creamy and velvety texture you can literally scoop and spread on a big hunk of freshly baked bread. We also tried the cured version of the same cheese that although was equally tasty, it showed a bit more acidity and finished on a slightly drier note. It was good, but didn’t strike me like its partner. 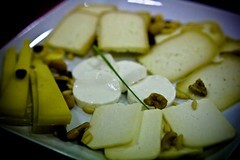 The Queijo da Castelo Branco, a small round semi cured sheep cheese measuring about 10 cm round and 7 high was fantastic. Cream colored cheese with a white thin rind and an intense sharp and slightly peppery aroma, it was delicious. Shouting its praises to Mafalda, however, led to a wonderful yet frightening surprise. Not five minutes later, she set down a plate of yellow crystallized cheese that made Limburger smell like daisies. This cheese had not just a nasty aroma, but an unbelievably strong salty flavour that literally clung to our plate for hours! 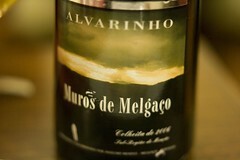 It was the fully cured version of the Castelo Branco which they called in Portuguese, chulé, meaning “dirty feet”. If you ever get a chance to try this, do so, but I highly suggest you wear a hazmat suit, because the moment you touch it, like permanent market, it stays with you! Other great features of the bar include the tasting menu that allows the customer to choose any three wines from their wine menu to have with your meal. If you’re unsure as to which wine pairs best with the smoked duck or salmon mousse, they will happily guide you through the experience explaining both the origin of the wine and how it was made. Maybe you’re more interested in bringing in bottle of wine to eat with your meal? Go for it. Although carrying a wide variety of Portuguese table wines, ports and dessert wines, they will happily uncork, or unscrew, your wine for free – no cork fee! We encourage you to also visit Garrafeira Campo de Ourique’s blog. Even if your Portuguese isn’t up to par, check out the wines Mafalda’s carrying, and feel free to ask her any questions you may have in Spanish, Portuguese or English. For all I know, she speaks more than these three, but at least you have a small set to choose from! Stay tuned for a follow up article on the 3 aged whites we tasted at Aromas & Sabores!